The Recovery of Private Jobs Under Obama, versus the Fall Under Bush. 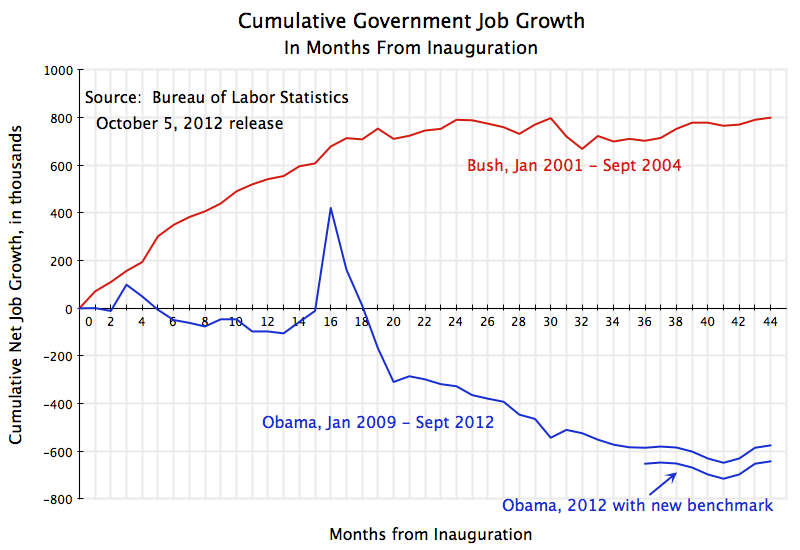 And the Cuts in Government Jobs Under Obama, versus the Rise Under Bush. Private jobs have grown under President Obama while they fell during the similar period of the administration of President Bush. And government jobs have fallen during Obama’s term while they rose under Bush. The figures above, prepared from data from the Bureau of Labor Statistics, shows the cumulative change in the number of private and government jobs, respectively, from their inaugurations to September of the fourth year of their administrations. This updates similar graphs and analysis posted earlier on this blog (here and here), although with a focus now on only Obama and Bush. Obama has been heavily criticized by Republican nominee Mitt Romney and by Republicans more generally for doing a terrible job on jobs. Their repeated theme is that the US has to return to the policies of George W. Bush of tax cuts, deregulation, and small government in order to create a “business friendly” environment in which private businessmen will then create jobs. 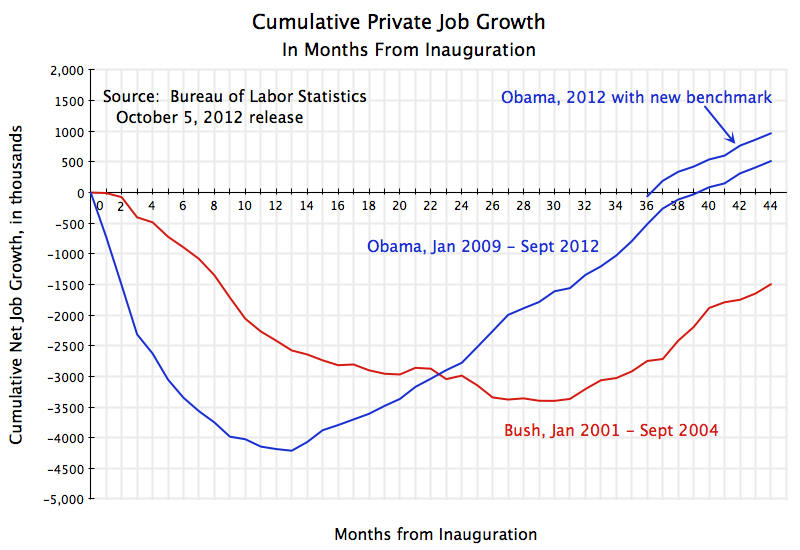 But as the top graph shows, private jobs have grown under Obama, in contrast to a fall under Bush. Obama was faced with a collapsing economy when he took office, with private jobs falling by 800,000 a month as he was taking office. He was able to turn this around within only a few months, as the stimulus package and other measures entered into effect, and jobs growth turned positive after just one year in office. This was a strong turnaround from the sharpest downturn the US economy had faced since the Great Depression. Since then, private job growth has continued each and every month, but at an overall pace that has been criticized. But the pace of recovery has in fact been better than that observed under Bush, where the number of private jobs had fallen steadily for the first two and a half years into his term (and with the fall starting only after he took office, in the Spring of 2001). Based on the current official numbers, there were about 0.5 million more private jobs in September 2012 than when Obama took office. This already contradicts the Republican claim that Obama’s policies have been destroying jobs. And the growth in private jobs has in fact been even higher. The BLS recently announced their preliminary estimate that in their regular annual re-benchmarking process, the number of private jobs were 453,000 higher in March 2012 than previously estimated. This would be an increase of 0.4% over the previous BLS estimate for private employment, and such a change is about average. Over the eleven years of 2002 to 2012, the changes due to the annual benchmark re-estimates have ranged between 0.1% and 0.9% (in absolute terms) – sometimes positive and sometimes negative. The BLS has not yet revised their job estimates reflecting this new benchmark; this will be done in early February 2013, when the revisions will be announced along with the January 2013 job figures. Based on the pattern observed in the previous annual re-benchmarking exercises, the March figure is likely to change by about the amount of the benchmark change (it will not be exactly the same for a number of reasons), with changes before that reaching back into 2011 diminishing as one goes back to the previous March 2011 benchmark period, and the changes increasing as one goes forward in 2012 from the March 2012 benchmark. Until the new analysis is done by the BLS experts and the standard models run, there is no way to say what the changes will be. For the diagrams above, I have very simplistically simply raised each of the 2012 private job estimates by 453,000, to give one a visual sense of the magnitude of the change. In reality, the increase will be phased in rather than jump abruptly as depicted, but it is not yet known how it will be phased in so I have not tried to show this. Based on this simple assumption, private jobs during Obama’s term from his inauguration to September 2012 have increased by about 1.0 million. During the similar period under Bush, private jobs fell by 1.5 million. Yet Obama is criticized for his job growth record, while Bush is praised. As seen in the figure above, government jobs have fallen by 575,000 during Obama’s term up through September 2012, using the current official BLS estimates. But the BLS benchmark revision, discussed above, estimates that there were 67,000 fewer government jobs in March 2012 than previously estimated. Adding this as a simple adjustment, government jobs fell by 642,000 during Obama’s term in office so far. Keep in mind that these are primarily state and local government jobs, as they account for 87% of government jobs in the US. But federal jobs have been flat over this period with no sharp increase either, and fell if one excludes an increase in the number of Defense Department employees. And in contrast to the fall in government jobs during Obama’s tenure, government jobs rose during the similar Bush period. Between his inauguration in January 2001 and September 2004, government jobs rose by 800,000 under Bush. There would be over 1.4 million additional jobs (mostly of school teachers, police, and other state and local workers) due to the direct impact alone if government jobs had been allowed to grow as they had under Bush rather than fall as they have under Obama. With a multiplier of two, there would be 2.8 million more jobs, and unemployment would be 6.0% instead of 7.8%. Unemployment would then be at the top end of what is generally considered to be the full employment range of unemployment (which will never be zero, due to turnover and other frictions). The myth is therefore quite different from the reality. Government jobs have been cut back during Obama’s term, and this has acted as a considerable drag on the economy. If government jobs had been allowed to increase during Obama’s term by as much as they had under Bush, we would now be at, or close to, full employment (see some further estimates at this blog posting). Yet Republicans continue to call for further and drastic cut-backs in government, with no recognition that there have already been sharp cuts and that these cuts have held back the pace of recovery. This entry was posted in Labor and tagged employment growth, government employment, Obama, private employment by aneconomicsense. Bookmark the permalink.